Published: Dec. 9, 2018 at 02:24 p.m.
Houston Texans safety Andre Hal grabs a tipped pass from Indianapolis Colts quarterback Andrew Luck. 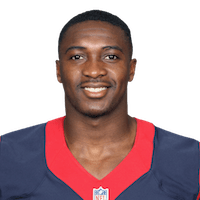 Published: Nov. 19, 2017 at 04:20 p.m.
Houston Texans safety Andre Hal picks off Arizona Cardinals quarterback Blaine Gabbert's pass intended for running back Kerwynn Williams. Published: Oct. 1, 2017 at 01:20 p.m.
Tennessee Titans quarterback throws the ball over the head of tight end Delanie Walker and is intercepted by Houston Texans safety Andre Hal. Published: Jan. 14, 2017 at 10:48 p.m.
New England Patriots quarterback Tom Brady is picked off by Houston Texans safety Andre Hal.